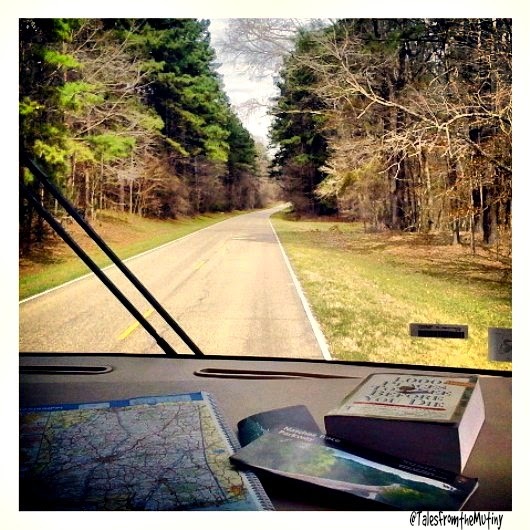 When we left Natchez we took the Natchez Trace Parkway as far as we could and then hopped back over to The Blues Highway. 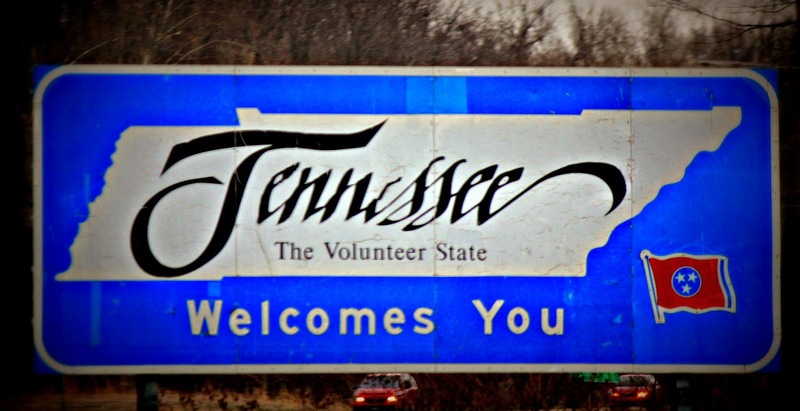 As soon as we crossed into Tennessee the entire landscape changed. Apparently, coming from this direction means entering the city through the poorest section, the litter so deep it looked like we were driving through a landfill, literally. We pretty much had the Natchez Trace Parkway all to ourselves. We had originally planned on trying to stay at one of the State Parks close to the city but after passing through that section of town we just didn’t feel like we could face the extreme poverty (and garbage) every time we wanted to go out. So, we ended up at Agricenter International, a farm and research center that hosts events throughout the year (kinda like a fairground). It’s located on the eastern outskirts of the city. The rates were fairly reasonable at $27 per night for 30 amps and full hookups or $30 per night for 50 amps and full hookups with the Farmer’s Market within walking distance. Just a couple of miles away is Shelby Farms Park Conservancy, a 4,500 acre green space offering 6.5 miles of hiking trails, an off-leash dog park, a disc course, horseback riding and bike rentals, a playground, boating, picnic areas and has it’s own herd of buffalo. I can’t speak for everyone who travels via RV to various places (for pleasure) but it kinda sounds like we are all pretty much a bunch of tourists. 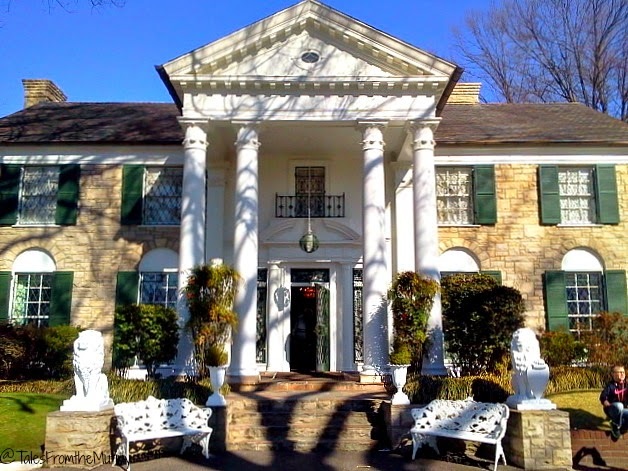 Anyway, Graceland was awesome…and tacky…and over-priced…and cool…and funky…and, dare I say, so worth the outlandish price they charge for admission (starting at $36 for adults) since, for us, it was truly a once-in-a-lifetime investment. 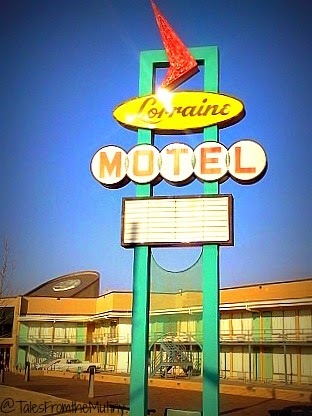 There aren’t a lot of words that can be used to describe Graceland (aside from tacky). 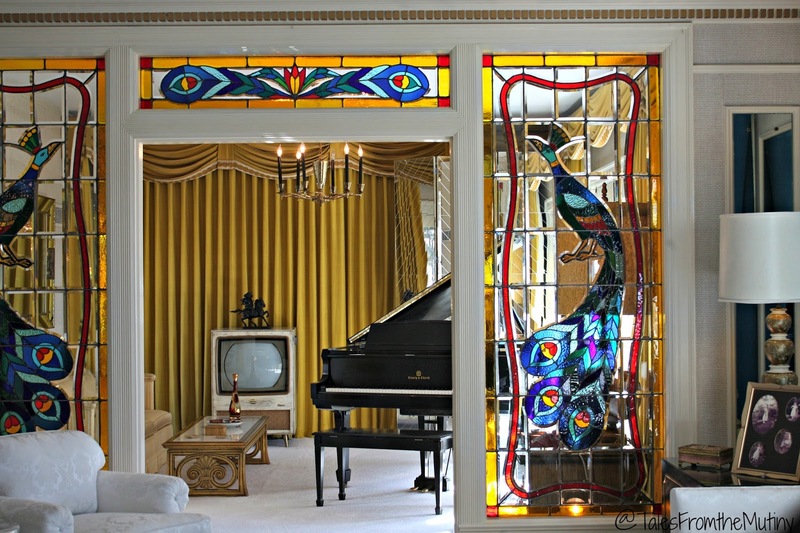 To compare Graceland to the McMansions mega-recording artists live in now will make you think Elvis lived humbly. By the way, he did give back to his community often…which is something you learn about on the self-guided tour. 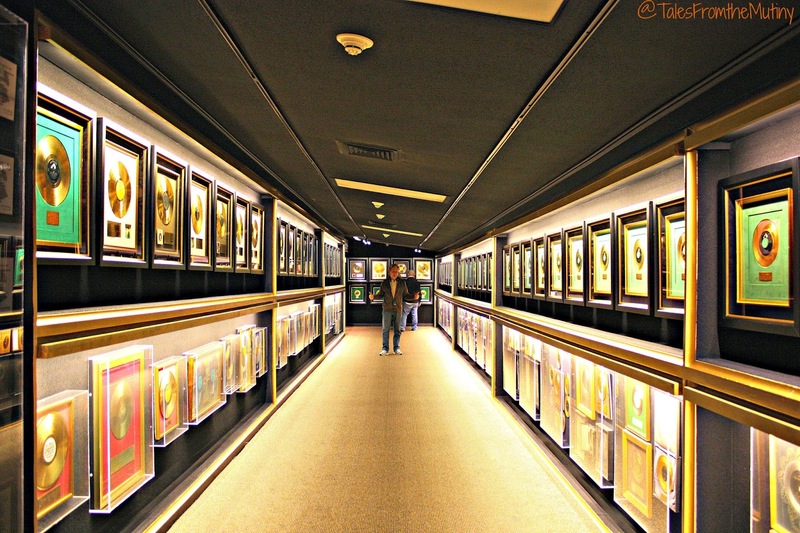 Just one of many halls full of Gold and Platinum Records. 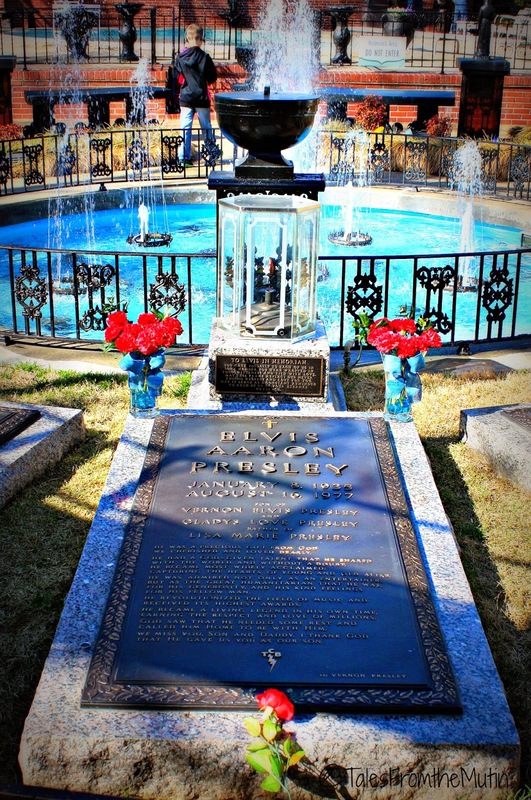 Elvis’ final resting place with the eternal flame. 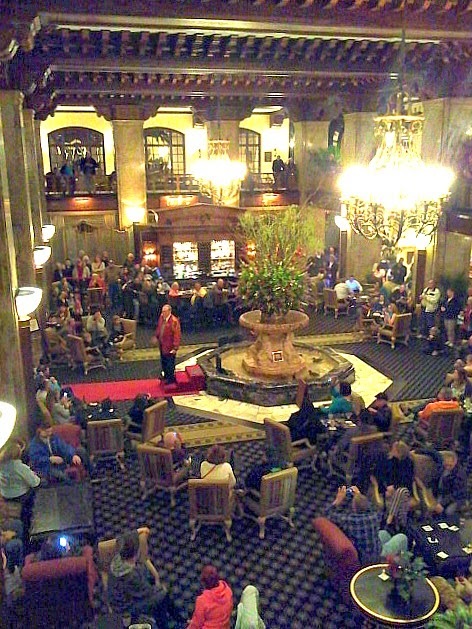 Another highlight was visiting the Historic Peabody Hotel in downtown Memphis. 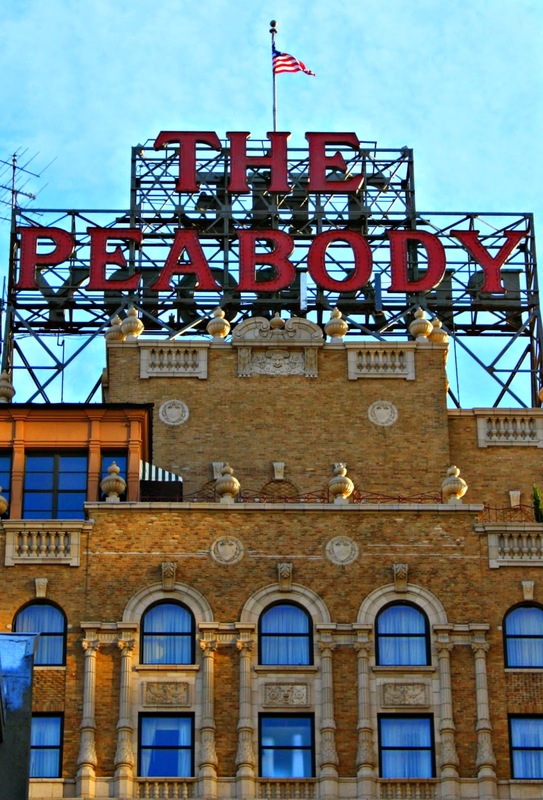 You may be wondering why on earth anyone would want to see a hotel (unless they are staying there) but the Peabody has something very special about it…the ducks(<<read about them here). 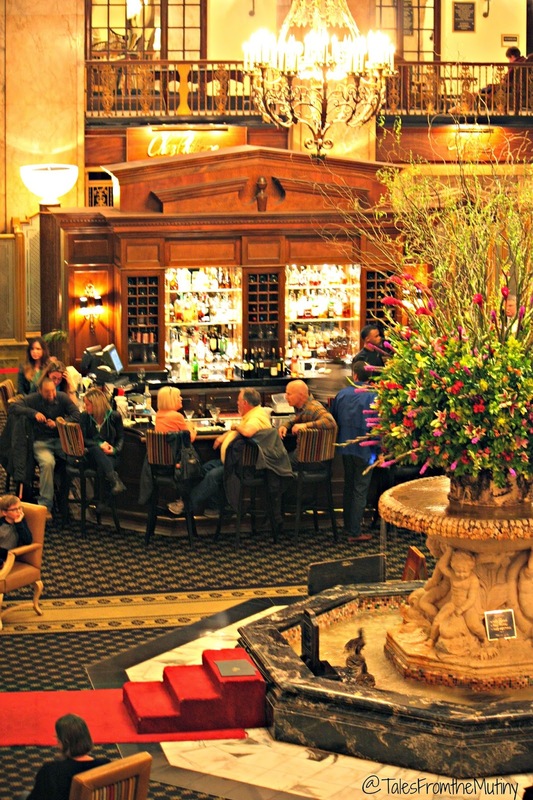 Overlooking the gorgeous bar and the red carpet as we wait for 5pm. 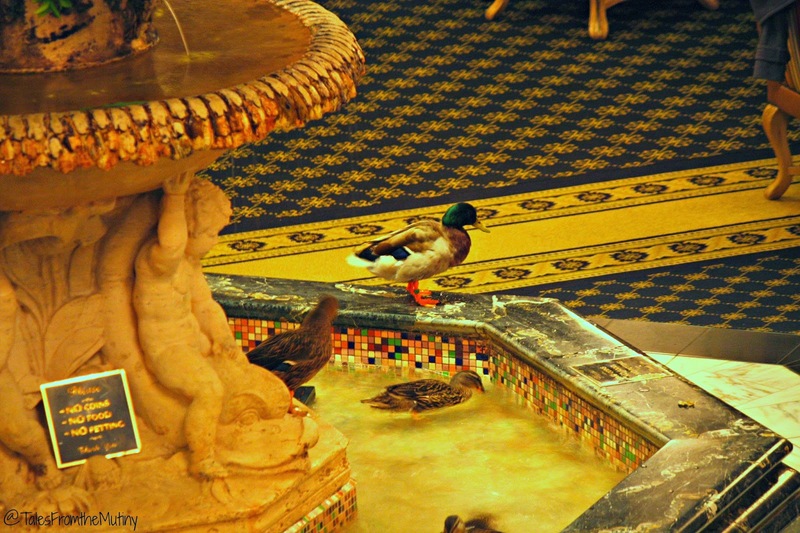 Every morning at 11am the ducks are brought from their penthouse on the top floor, down the elevator and to the travertine fountain where they hang out until 5pm. Promptly at 5pm there is a large ceremony and the ducks are lead down the red carpet and taken back to their penthouse. There’s no charge to attend but it does get crowded so get there early (go upstairs for an even better view). 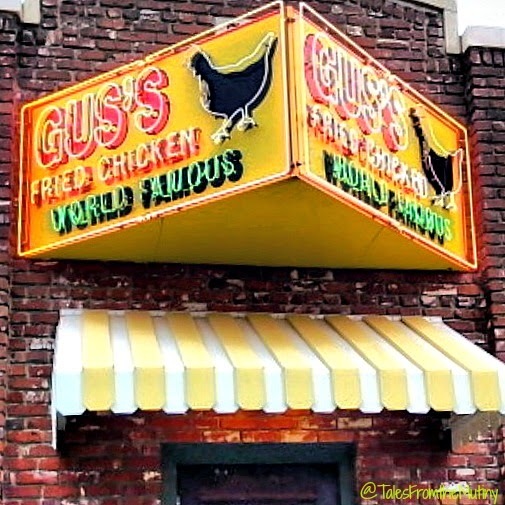 We were also happy to try out two very highly recommended BBQ joints. 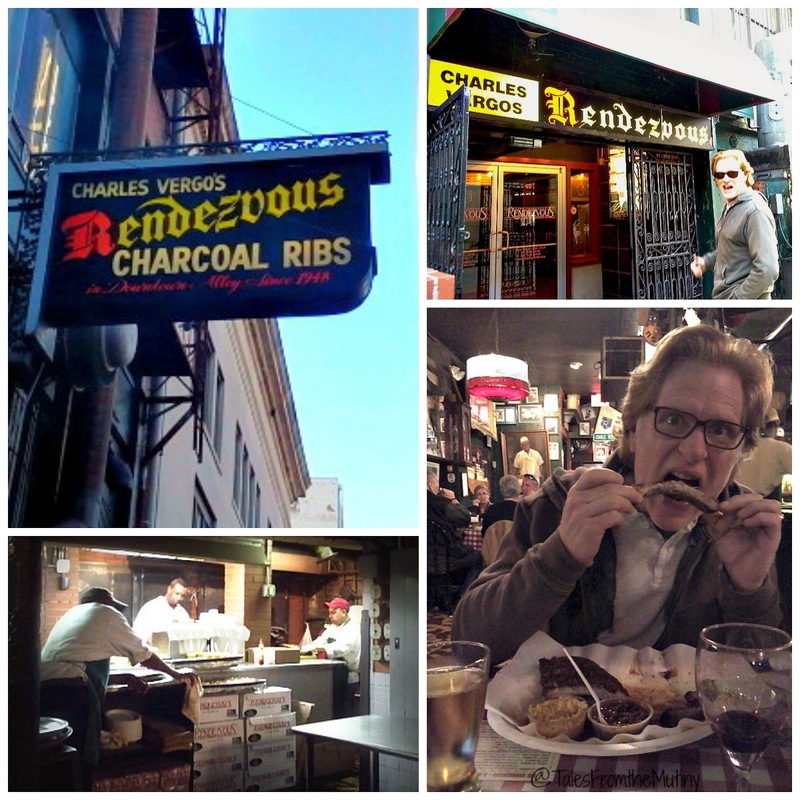 One was the famous Charles Vergo’s Rendezvous, located in a basement down some random alley in the downtown area…which happens to serve a delicious vegan red beans and rice plate (score!!) along with a whole lot of pork for the meat-eaters. 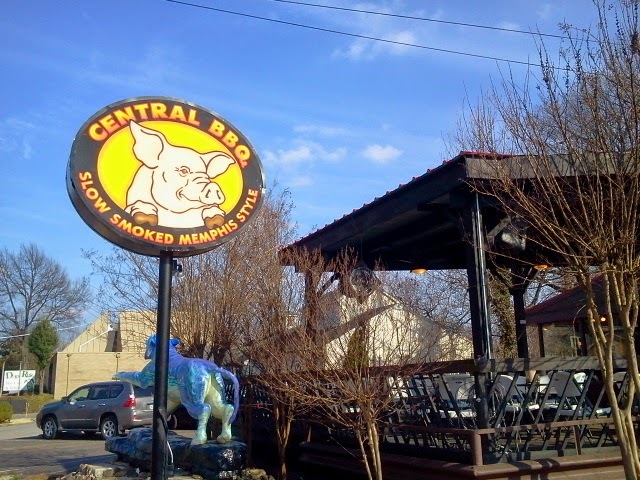 The other BBQ joint, which was maybe even slightly better than the Rendezvous, was Central BBQ. 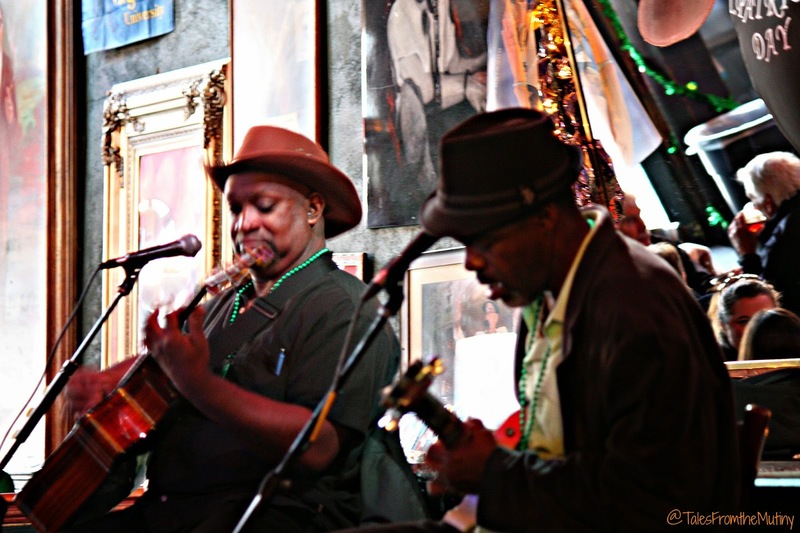 There are three locations, one of which is conveniently located right behind the Lorraine Motel/Civil Rights Museum in downtown.Central also offers a Portabella Mushroom Burger for a meat-free, and delicious, option. 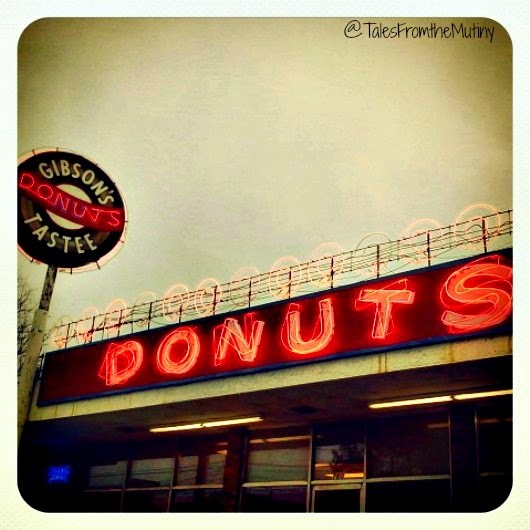 And lo’ and behold Gus’s shared a parking lot with Gibson’s Donuts. Gibson’s is constantly winning awards for their donuts (yep, apparently there are donut awards) yet their prices remain low (something like $0.83 per donut) which is unheard of these days. Although they have succumbed to the pressure to serve those weird, fancy combinations like maple bacon and red velvet, they also make a killer cake donut. The Buttermilk Drop is THE donut to get but they don’t make them all the time. As a matter of fact, they didn’t have any when we went so we “settled” for Blueberry Cake, which were great (but still not better than Wall Drug Store in SD). 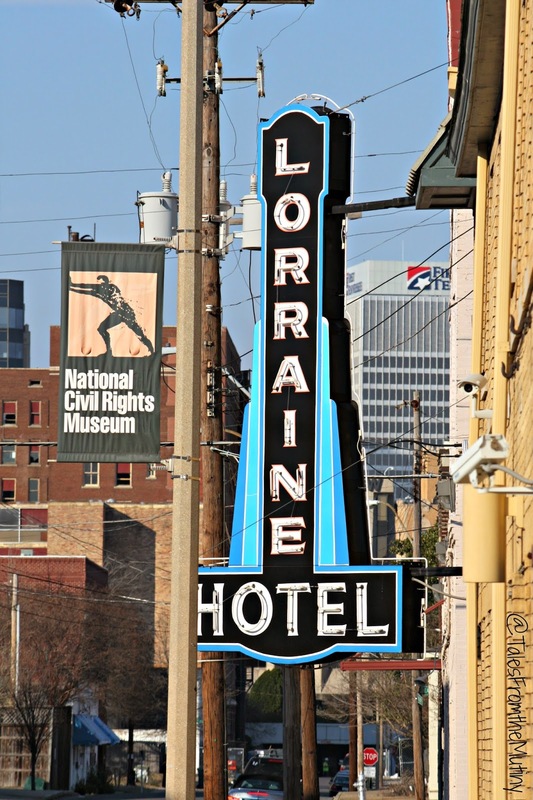 On a more serious note the National Civil Rights Museum, which was built at the sight of Martin Luther King Jr.’s assassination at The Lorraine Motel, should be high on your list of places to visit. It’s a part of American history that is still living and evolving and should never be forgotten. 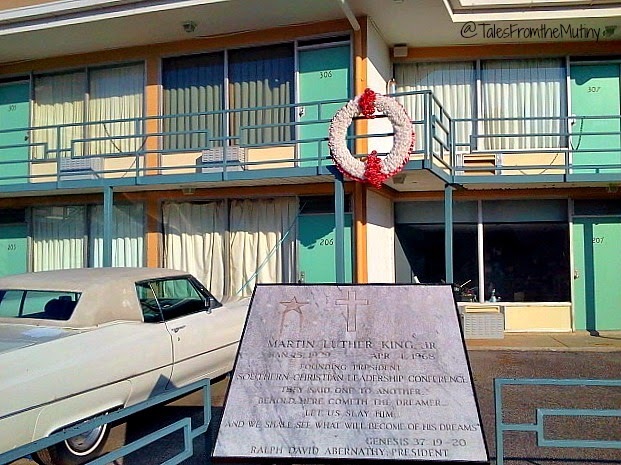 The wreath marks the spot Dr. King died. Although I wasn’t even born yet I, of course, know the story and couldn’t hold back the tears. Once again we found ourselves with not enough time (or money) to do everything this time around. 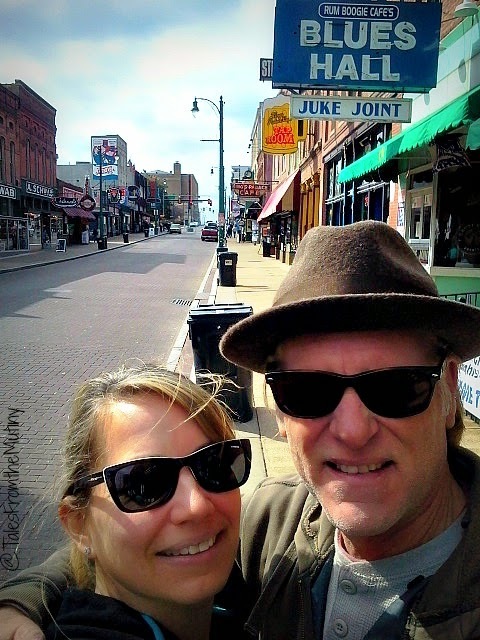 Memphis has so much to offer from live music and juke joints to museums and great food. We also found that their are miles of bike trails that take you to various areas in the city and the suburbs. Yoga and vegan foods are pretty popular and it’s a surprisingly health conscious area (or at least it’s starting to be). It’s a place we hope to come back to soon. 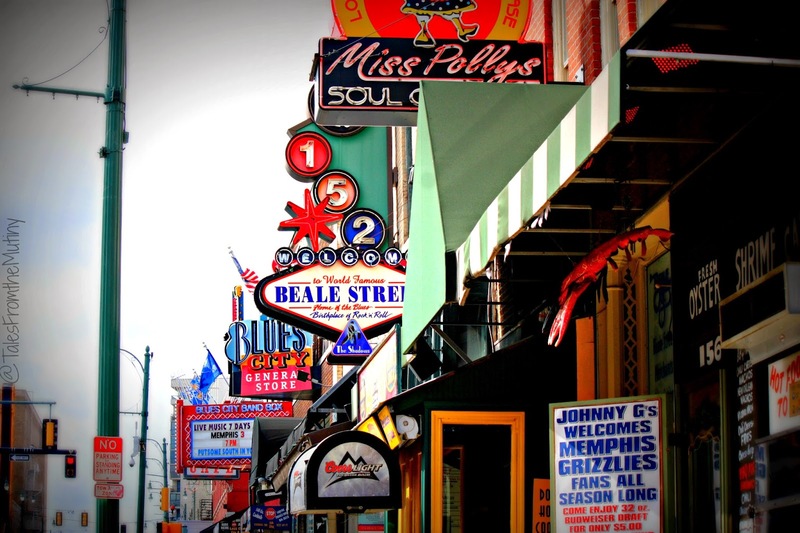 What are some of your favorite spots in Memphis? We’d love to try them out the next time we pass through.